Recently I decided my caricature needed a bit of a kick along so for the past 3 weeks I've been drawing no less than 20 caricatures a day. Just quick pencil sketches - 5 minutes each. I've also been trying to pick up my photoshop skills. At the moment the photoshop ones feel a bit labored but hoping to get a better flow with them the more I do them. Btw the caricatures aren't famous people. 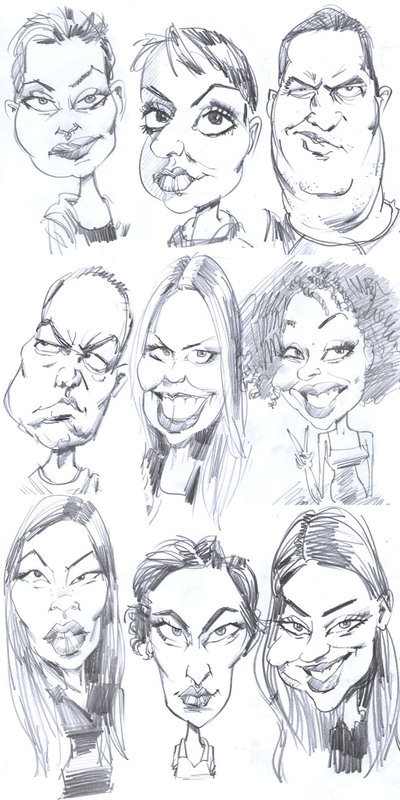 Normally I'd draw famous people - or people I know, so I pretty much know if I have a like or not but for the sake of speed I've just been typing in "face" or "asian face", "interesting face", "something or other face" in Google images then just draw them in sequence. Click on the first face then the other 7 prompts till I have my 20 or so. Unless the res is too low or the photo too stupid. The interesting thing is that no matter what kind of "face" is typed into google, there's always a much higher number of female faces than male faces that come up. What does that mean? The tragic thing is, when you type in "Australian face" you get a whole bunch of photos with people with the Australian flag painted on their face. It's my country and I shld be proud of it - and am, in ways .. but seriously, I can see why we often come across as idiots. The exercise feels worthwhile. The drawings themselves are pretty scratchy but there are moments of improvement. My plan is to do this till I draw 1000 of them (approx 7 weeks, so almost half way there). An idea, no doubt, planted in my mind from a friend of mine Ron Chiu who is currently doing his own project of drawing 1000 portraits. His approach is different in that he's been traveling and drawing people he meets along the way - which sounds fantastic, and he's doing a great job. Good on you Ron and thanks for the inspiration. Above are a few examples. Obviously I've cherry picked. That's alright isn't it?